Audrey J. Weiss, Ph.D., Kathryn R. Fingar, Ph.D., M.P.H., Marguerite L. Barrett, M.S., Anne Elixhauser, Ph.D., Claudia A. Steiner, M.D., M.P.H., Peggi Guenter, Ph.D., R.N., and Mary Hise Brown, Ph.D. This Healthcare Cost and Utilization Project (HCUP) Statistical Brief presents national estimates on the characteristics of malnutrition reported during nonmaternal and nonneonatal hospital inpatient stays in 2013. Although malnutrition can include high caloric intake associated with overweight and obesity when defined broadly as nutritional imbalance, this Statistical Brief examines undernutrition only. This Statistical Brief presents the frequency of occurrence of the six types of malnutrition. Patient-level characteristics, admission and discharge characteristics, and outcomes for malnutrition-related stays are provided by malnutrition type. Finally, the most common primary conditions and specific principal diagnoses are presented for the different types of malnutrition-related stays. Differences in estimates of 10 percent or greater are noted in the text. 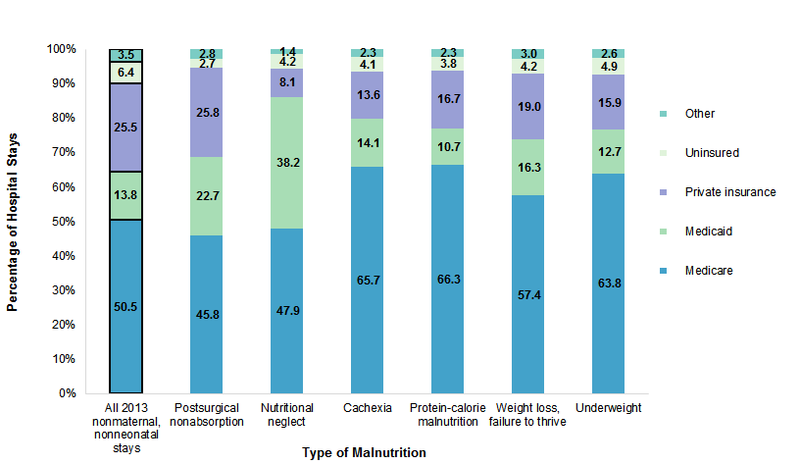 Figure 1 provides the distribution of six types of malnutrition among hospital inpatient stays in 2013. In 2013, there were nearly 2 million hospital inpatient stays involving malnutrition. The most common type was protein-calorie malnutrition (63.9 percent of all malnutrition stays), accounting for 4.5 percent of all inpatient stays and 9.1 percent of aggregate costs (nonmaternal and nonneonatal only). Other malnutrition-related stays were for weight loss or failure to thrive (21.6 percent of all malnutrition stays), cachexia (8.3 percent), underweight (4.4 percent), postsurgical nonabsorption (1.7 percent), and nutritional neglect (0.1 percent). Patients with malnutrition tended to be older (especially 85 years or older), black, and from low income and rural areas. Compared with other types of malnutrition, in-hospital mortality was higher for stays with cachexia (11.7 percent died in the hospital) and protein-calorie malnutrition (8.4 percent)—4 to 5 times the in-hospital death rate of all nonmaternal, nonneonatal stays (2.4 percent). Average hospital costs were higher for stays involving protein-calorie malnutrition ($25,200) and postsurgical nonabsorption ($23,000) than for other malnutrition stays. Principal diagnoses varied by type of malnutrition: medical, surgical, or device complications were common for postsurgical nonabsorption; injuries and conditions due to external causes were common for nutritional neglect. Septicemia was common among all types of malnutrition. Pie chart showing the number and percentage of six types of hospital stays with malnutrition. 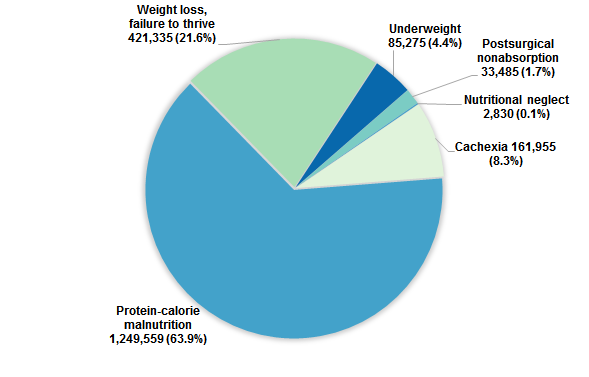 Protein-calorie malnutrition: 1,249,559 stays, 63.9%; weight loss, failure to thrive: 421,335 stays, 21.6%; cachexia: 161,955 stays, 8.3%; underweight: 85,275 stays, 4.4%; postsurgical nonabsorption: 33,485 stays, 1.7%; nutritional neglect: 2,830 stays, 0.1%. Protein-calorie malnutrition was the most common type of malnutrition among hospital inpatient stays. In 2013, there were 1.95 million hospital stays that involved malnutrition, representing 7.1 percent of the 27.6 million total nonmaternal and nonneonatal stays (data not shown). Approximately 1.25 million malnutrition-related stays (63.9 percent) were categorized as protein-calorie malnutrition. Weight loss or failure to thrive was the next most common type of malnutrition, at 21.6 percent of all malnutrition-related stays. The remaining four malnutrition types combined constituted about 15 percent of all malnutrition-related hospital stays: cachexia (8.3 percent), underweight (4.4 percent), postsurgical nonabsorption (1.7 percent), and nutritional neglect (less than 1 percent). Table 1 provides characteristics of malnutrition-related hospital stays by type of malnutrition in 2013. On average, patients with cachexia, protein-calorie malnutrition, and underweight were older, whereas patients with postsurgical nonabsorption and nutritional neglect tended to be younger. The mean patient age among malnutrition-related hospital stays was highest for stays involving cachexia (68.3 years), protein-calorie malnutrition (66.9 years), and underweight (65.0 years). Mean patient age was approximately 20 years younger for malnutrition-related stays involving postsurgical nonabsorption (47.1 years) and nutritional neglect (47.5 years). The rate of hospitalization was highest for patients aged 65 years and older across all six types of malnutrition. Furthermore, the hospitalization rate for patients aged 85 years and older was 2.5-3.5 times higher than for patients aged 65-84 years for all types of malnutrition except postsurgical nonabsorption. For example, among patients aged 85+ years, there were 3,613 hospital stays per 100,000 population for protein-calorie malnutrition compared with 1,439 stays per 100,000 among those aged 65-84 years. A similar pattern was seen for weight loss, failure to thrive—1,413 stays per 100,000 for those aged 85 years and older compared with 415 per 100,000 among 65-84 year olds. Blacks had the highest rate of hospitalization involving malnutrition-related stays, and Hispanics had the lowest rate. Across all six types of malnutrition-related hospital stays, Blacks had the highest hospitalization rate, Whites had the next highest rate, and Hispanics had the lowest rate. For example, for the most common type of malnutrition (protein-calorie malnutrition), there were 451 stays per 100,000 population among Blacks compared with 175 stays per 100,000 population among Hispanics. The rate of malnutrition-related hospital stays was highest for the lowest-income communities. Across all six types of malnutrition-related hospital stays, the rate of hospitalization was generally highest in low-income communities and decreased progressively with increases in community income level. Again, focusing on the most common type of malnutrition (protein-calorie malnutrition), there were 494 hospital stays per 100,000 population in the lowest-income communities (quartile 1) compared with 285 stays per 100,000 in the highest-income communities (quartile 4). For most types of malnutrition, the highest rate of hospitalization was in rural areas. Patients from rural areas tended to be hospitalized with malnutrition at a higher rate than did those from more populated areas. For example, among patients with protein-calorie malnutrition, there were 470 hospital stays per 100,000 population for rural patients compared with 349 stays per 100,000 for patients from suburban areas. Figure 2 provides the expected payer distribution of malnutrition-related hospital stays by type of malnutrition in 2013. For reference, the distribution of all 2013 nonmaternal, nonneonatal stays also is provided. Stacked bar chart showing percentage of hospital stays by expected payer and malnutrition type. All 2013 nonmaternal, nonneonatal stays: Medicare, 50.5%; Medicaid, 13.8%; private insurance, 25.5%; uninsured, 6.4%; other, 3.5%. Postsurgical nonabsorption: Medicare, 45.8%; Medicaid, 22.7%; private insurance, 25.8%; uninsured, 2.7%; other, 2.8%. Nutritional neglect: Medicare, 47.9%; Medicaid, 38.2%; private insurance, 8.1%; uninsured, 4.2%; other, 1.4%. Cachexia: Medicare, 65.7%; Medicaid, 14.1%; private insurance, 13.6%; uninsured, 4.1%; other, 2.3%. Protein-calorie malnutrition: Medicare, 66.3%; Medicaid, 10.7%; private insurance, 16.7%; uninsured, 3.8%; other, 2.3%. Weight loss, failure to thrive: Medicare, 57.4%; Medicaid, 16.3%; private insurance, 19.0%; uninsured, 4.2%; other, 3.0%. Underweight: Medicare, 63.8%; Medicaid, 12.7%; private insurance, 15.9%; uninsured, 4.9%; other, 2.6%. Medicaid was the expected payer for a disproportionate share of malnutrition stays involving postsurgical nonabsorption and nutritional neglect; Medicare was the expected payer for a disproportionate share of other types of malnutrition-related stays. Compared with all nonmaternal, nonneonatal hospital stays in 2013, a higher proportion of stays involving postsurgical nonabsorption or nutritional neglect had an expected primary payer of Medicaid (22.7 and 38.2 percent, respectively, vs. 13.8 percent for all stays). Among the other four types of malnutrition-related stays, between 57.4 and 66.3 percent of stays had an expected primary payer of Medicare compared with only half of all nonmaternal, nonneonatal stays (50.5 percent). Table 2 provides admission and discharge characteristics and outcomes for malnutrition-related hospital stays by malnutrition type, in 2013.
a Because two frequent codes in the underweight malnutrition type (V85.0 and V85.51) are exempt from present-on-admission reporting, this information is not reported. b Includes transfer to a skilled nursing facility, intermediate care facility, or another type of health care facility. Malnutrition was present on admission and was reported as a secondary diagnosis for the majority of malnutrition-related hospital stays. Malnutrition was identified as present on admission for more than 80 percent of hospital stays involving malnutrition across all types of malnutrition except underweight.9 (For this condition, several diagnostic codes are exempt from present-on-admission reporting.) Malnutrition also was much more likely to be reported as a secondary than as a principal diagnosis, ranging from 82.5 percent of stays involving nutritional neglect to 100.0 percent of stays with underweight diagnoses. Hospital stays involving malnutrition accounted for over 12 percent of aggregate hospital costs among nonmaternal and nonneonatal stays in 2013. In 2013, the aggregate cost of all nonmaternal and nonneonatal stays was $346.1 billion (data not shown). Hospital stays involving malnutrition accounted for nearly $42 billion, or 12.1 percent of aggregate nonmaternal, nonneonatal hospital costs. In contrast, as described earlier, hospital stays involving malnutrition constituted only 7.1 percent of all nonmaternal and nonneonatal hospital stays in 2013. Hospitals stays involving malnutrition were discharged to home less often compared with all nonmaternal, nonneonatal stays. Compared with all nonmaternal, nonneonatal hospital stays in 2013, a lower proportion of stays across all six types of malnutrition had a routine discharge (ranging from a low of 31.2 percent for cachexia to a high of 53.1 percent for postsurgical nonabsorption, vs. 62.5 percent for all nonmaternal, nonneonatal stays, data not shown). Very few malnutrition-related stays included enteral or parenteral nutrition services. With one exception, fewer than 7 percent of malnutrition-related stays, across malnutrition types, included coding of enteral or parenteral nutrition services. Parenteral nutrition was coded during 28.7 percent of stays involving postsurgical nonabsorption. Figure 3 presents information on in-hospital deaths by type of malnutrition in 2013. For reference, the proportion of in-hospital deaths among all nonmaternal, nonneonatal hospital stays also is provided. Bar chart showing percentage of malnutrition stays resulting in death. All 2013 nonmaternal, nonneonatal stays: 2.4%; postsurgical nonabsorption: 2.3; nutritional neglect: 3.9; cachexia: 11.7; protein-calorie malnutrition: 8.4; weight loss, failure to thrive: 4.5; underweight: 3.7. Hospital stays involving cachexia and protein-calorie malnutrition had the highest mortality rate compared with other malnutrition-related hospital stays. Compared with the in-hospital death rate among all nonmaternal, nonneonatal hospital stays (2.4 percent), malnutrition-related stays for all types of malnutrition except postsurgical nonabsorption had a substantially higher proportion of in-hospital deaths, ranging from 1.5 times higher for underweight diagnoses to nearly 5 times higher for cachexia. Overall, more than 1 in 10 hospital stays involving cachexia (11.7 percent) and more than 1 in 12 stays involving protein-calorie malnutrition (8.4 percent) resulted in death in the hospital. 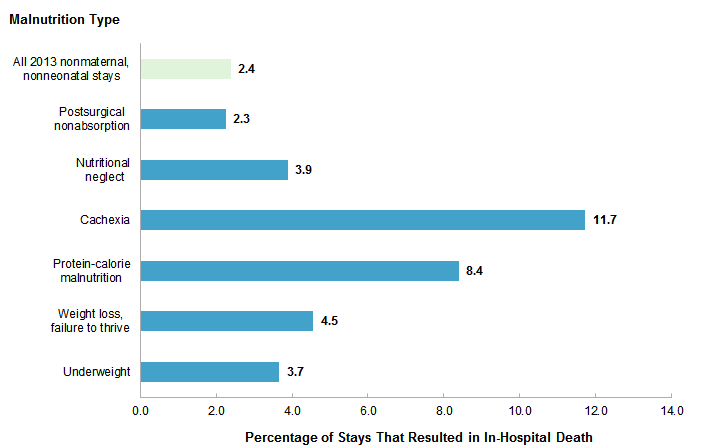 Figure 4 presents the average length of stay in the hospital by type of malnutrition in 2013. For reference, the average length of stay among all nonmaternal, nonneonatal hospital stays also is provided. 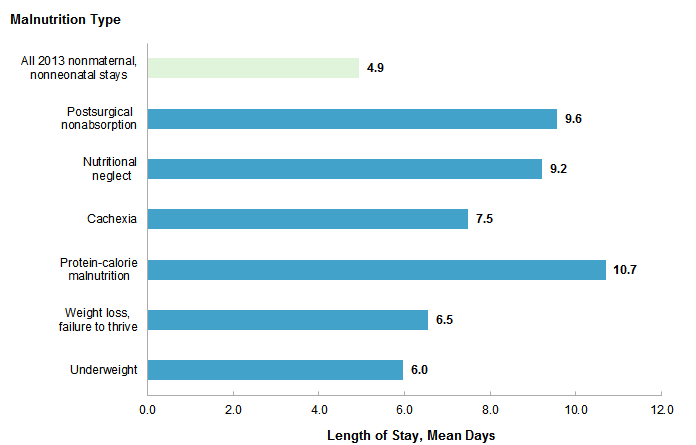 Bar chart showing average length of hospital stay in days by malnutrition type. All 2013 nonmaternal, nonneonatal stays: 4.9; postsurgical nonabsorption: 9.6; nutritional neglect: 9.2; cachexia: 7.5; protein-calorie malnutrition: 10.7; weight loss, failure to thrive: 6.5; underweight: 6.0. Hospital stays involving protein-calorie malnutrition, postsurgical nonabsorption, and nutritional neglect were longer on average compared with other malnutrition-related hospital stays and about twice as long as the average length of stay overall. Compared with the average length of all nonmaternal, nonneonatal hospital stays (4.9 days), malnutrition-related stays for all six types of malnutrition were longer on average, ranging from 20 percent longer for underweight diagnoses to more than twice as long for protein-calorie malnutrition. On average, the longest malnutrition-related stays involved protein-calorie malnutrition (10.7 days), postsurgical nonabsorption (9.6 days), and nutritional neglect (9.2 days). 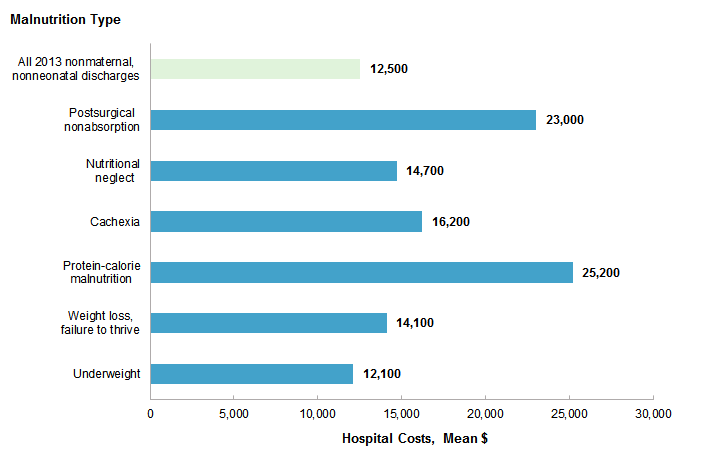 Figure 5 presents average hospital costs for stays by type of malnutrition in 2013. For reference, the average hospital cost among all nonmaternal, nonneonatal hospital stays also is provided. Bar chart showing average hospital costs in dollars by malnutrition type. All 2013 nonmaternal, nonneonatal stays: 12,500; postsurgical nonabsorption: 23,000; nutritional neglect: 14,700; cachexia: 16,200; protein-calorie malnutrition: 25,200; weight loss, failure to thrive: 14,100; underweight: 12,100. Hospital stays involving protein-calorie malnutrition and postsurgical nonabsorption were the most costly compared with other malnutrition-related hospital stays. Compared with the average cost of all nonmaternal, nonneonatal hospital stays ($12,500), malnutrition-related stays for all types of malnutrition except underweight were more costly, ranging from 13 percent more costly for weight loss or failure to thrive diagnoses to twice as costly for protein-calorie malnutrition. On average, the highest-cost malnutrition-related stays involved protein-calorie malnutrition ($25,200) and postsurgical nonabsorption ($23,000). The most common reasons for hospital stays involving malnutrition by malnutrition type in 2013 are provided in Table 3 (general reasons) and Table 4 (specific reasons). Table 3 focuses on primary condition groupings, which are based on broad body systems or etiology. Table 4 focuses on principal diagnoses, which are more specific categories of conditions. Notes: A dash indicates that the condition did not rank among the top five primary condition groupings for that type of malnutrition. Denominators for all percentage calculations are the total number of hospital stays for each malnutrition type. a Primary condition grouping was identified based on the diagnosis chapter of the International Classification of Diseases, Ninth Revision, Clinical Modification (ICD-9-CM). Injury and poisoning was the most common primary condition grouping for malnutrition-related stays involving postsurgical nonabsorption and nutritional neglect; respiratory and digestive system diseases were common among other types of malnutrition-related stays. More than one-fourth of malnutrition-related hospital stays involving postsurgical nonabsorption or nutritional neglect had an injury and poisoning primary condition grouping, a broad category of conditions that includes trauma, burns, hip fractures, and complications of care. Respiratory system disease was the most common primary condition grouping among stays involving cachexia (20.5 percent) and underweight diagnoses (17.3 percent). Respiratory system disease also was common for malnutrition-related stays involving weight loss or failure to thrive diagnoses (13.5 percent) and protein-calorie malnutrition (12.7 percent). Other common primary condition groupings included digestive system disease (ranked in the top five conditions for all malnutrition types except nutritional neglect, and first for weight loss or failure to thrive), infectious and parasitic disease (ranked in the top five conditions for all malnutrition types except weight loss/failure to thrive and underweight, and first for protein-calorie malnutrition), and circulatory system disease (ranked in the top 5 conditions for all malnutrition types except postsurgical nonabsorption and nutritional neglect). Mental illness was the fourth most common primary condition grouping and represented more than 10 percent of malnutrition-related stays involving nutritional neglect. Neoplasms were among the top five grouped conditions for stays involving cachexia, weight loss or failure to thrive, and underweight diagnoses. Table 4 lists the five most common principal diagnoses for malnutrition-related hospital stays by malnutrition type in 2013. These are more specific categories of conditions than the body system/etiology groupings in Table 3. Notes: A dash indicates that the condition did not rank among the top five principal Clinical Classifications Software (CCS) diagnoses for that type of malnutrition. Denominators for all percentage calculations are the total number of hospital stays for each malnutrition type. Septicemia was a common principal diagnosis among all types of malnutrition-related stays. Septicemia—a potentially overwhelming infection of the bloodstream—was the most common principal diagnosis among malnutrition-related stays categorized as protein-calorie malnutrition (15.7 percent of stays), cachexia (11.5 percent of stays), and weight loss or failure to thrive (5.4 percent of stays). Septicemia also was the second most common principal diagnosis for stays involving nutritional neglect (9.5 percent of stays) and stays with underweight diagnoses (5.6 percent of stays), and it ranked third for stays involving postsurgical nonabsorption (6.4 percent of stays). Other common principal diagnoses among malnutrition-related stays included medical or device complications (for postsurgical nonabsorption), injuries and conditions due to external causes (for nutritional neglect), and pneumonia (for other types of malnutrition-related stays). More than one-fourth of stays involving postsurgical nonabsorption were for complications of medical devices (15.3 percent) or medical or surgical care (10.6 percent). Nearly one in five stays involving nutritional neglect were for injuries and conditions due to external causes (19.1 percent). For the remaining four malnutrition types, pneumonia was a leading primary condition, ranking first among stays categorized as underweight and second among stays categorized as cachexia, protein-calorie malnutrition, and weight loss or failure to thrive. All-listed procedures include all procedures performed during the hospital stay, whether for definitive treatment or for diagnostic or exploratory purposes. The first-listed procedure is the procedure that is listed first on the discharge record. Inpatient data define this as the principal procedure—the procedure that is performed for definitive treatment rather than for diagnostic or exploratory purposes (i.e., the procedure that was necessary to take care of a complication). CCS categorizes ICD-9-CM diagnosis codes and procedure codes into a manageable number of clinically meaningful categories.11 This clinical grouper makes it easier to quickly understand patterns of diagnoses and procedure use. CCS categories identified as Other typically are not reported; these categories include miscellaneous, otherwise unclassifiable diagnoses and procedures that may be difficult to interpret as a group. The six types of malnutrition were defined using the ICD-9-CM diagnosis codes listed in Table 5. Maternal and neonatal discharges, identified by Major Diagnostic Category (MDC) 14 (Pregnancy, Childbirth & the Puerperium) and MDC 15 (Newborns and Other Neonates With Conditions Originating in the Perinatal Period), were excluded from the analysis. Discharges identified only as a personal history or screening for malnutrition were not included (V12.1, Personal history of nutritional deficiency; V77.2, Special screening for malnutrition). If a single inpatient record included multiple diagnosis codes indicating different types of malnutrition (e.g., nutritional neglect and underweight), the record was classified into the higher-ranked type of malnutrition (in this example, nutritional neglect). If both types of malnutrition at the same hierarchy level appeared on a discharge record (e.g., both postsurgical nonabsorption and nutritional neglect), then the record was classified into the malnutrition type that appeared first on the record. Table 6 reports the frequency of the six different types of malnutrition by individual diagnosis code among hospital inpatient stays in 2013. The following two additional statistics are provided: (1) the frequency with which each code is the only type of malnutrition code reported on the hospital discharge record and (2) the frequency with which each code occurs either alone or before any other malnutrition code reported on the record. Receipt of enteral and parenteral nutrition was based on CCS procedure category 223. CCS 223 includes ICD-9-CM procedure code 966 (Enteral infusion of concentrated nutritional substances) and ICD-9-CM procedure code 9915 (Parenteral infusion of concentrated nutritional substances). The National Inpatient Sample (NIS) is based on data from community hospitals, which are defined as short-term, non-Federal, general, and other hospitals, excluding hospital units of other institutions (e.g., prisons). The NIS includes obstetrics and gynecology, otolaryngology, orthopedic, cancer, pediatric, public, and academic medical hospitals. Excluded are long-term care facilities such as rehabilitation, psychiatric, and alcoholism and chemical dependency hospitals. Beginning in 2012, long-term acute care hospitals are also excluded. However, if a patient received long-term care, rehabilitation, or treatment for a psychiatric or chemical dependency condition in a community hospital, the discharge record for that stay will be included in the NIS. Total hospital charges were converted to costs using HCUP Cost-to-Charge Ratios based on hospital accounting reports from the Centers for Medicare & Medicaid Services (CMS).12 Costs reflect the actual expenses incurred in the production of hospital services, such as wages, supplies, and utility costs; charges represent the amount a hospital billed for the case. For each hospital, a hospital-wide cost-to-charge ratio is used. Hospital charges reflect the amount the hospital billed for the entire hospital stay and do not include professional (physician) fees. For the purposes of this Statistical Brief, mean costs are reported to the nearest hundred. Admission source (now known as the patient's point of origin) indicates where the patient was located prior to admission to the hospital. Emergency admission indicates that the patient was admitted to the hospital through the emergency department. Admission from another hospital indicates that the patient was admitted to this hospital from another short-term, acute-care hospital. This usually signifies that the patient required the transfer in order to obtain more specialized services that the originating hospital could not provide. Admission from a long-term care facility indicates that the patient was admitted from a long-term facility such as a nursing home. Data on Hispanic ethnicity are collected differently among the States and also can differ from the Census methodology of collecting information on race (White, Black, Asian/Pacific Islander, American Indian/Alaska Native, Other (including mixed race)) separately from ethnicity (Hispanic, non-Hispanic). State data organizations often collect Hispanic ethnicity as one of several categories that include race. Therefore, for multistate analyses, HCUP creates the combined categorization of race and ethnicity for data from States that report ethnicity separately. When a State data organization collects Hispanic ethnicity separately from race, HCUP uses Hispanic ethnicity to override any other race category to create a Hispanic category for the uniformly coded race/ethnicity data element, while also retaining the original race and ethnicity data. This Statistical Brief reports race/ethnicity for the following categories: Hispanic, non-Hispanic White, non-Hispanic Black, and non-Hispanic Other. For additional HCUP statistics, visit HCUP Fast Stats at http://www.hcup-us.ahrq.gov/faststats/landing.jsp for easy access to the latest HCUP-based statistics for health information topics, or visit HCUPnet, HCUP's interactive query system, at http://hcupnet.ahrq.gov/. Weiss AJ (Truven Health Analytics), Fingar KR (Truven Health Analytics), Barrett ML (M.L. Barrett, Inc.), Elixhauser A (AHRQ), Steiner CA (AHRQ), Guenter P (American Society for Parenteral and Enteral Nutrition), Brown MH (Baxter International, Inc.). Characteristics of Hospital Stays Involving Malnutrition, 2013. HCUP Statistical Brief #210. September 2016. Agency for Healthcare Research and Quality, Rockville, MD. http://www.hcup-us.ahrq.gov/reports/statbriefs/sb210-Malnutrition-Hospital-Stays-2013.pdf. The authors would like to acknowledge the contributions of Ainsley Malone of the American Society for Parenteral and Enteral Nutrition, Evangelia Davanos and Crystal Riley of Baxter Healthcare Corporation, and Minya Sheng of Truven Health Analytics. This Statistical Brief was posted online on September 20, 2016. 1 White JV, Guenter P, Jensen G, Malone A, Schofield M, Academy Malnutrition Work Group, et al. Consensus statement: Academy of Nutrition and Dietetics and American Society for Parenteral and Enteral Nutrition: characteristics recommended for the identification and documentation of adult malnutrition (undernutrition). Journal of Parenteral and Enteral Nutrition. 2012:36(3):275-83. 2 Corkins MR, Guenter P, DiMaria-Ghalili RA, Jensen GL, Malone A, Miller S, et al. Malnutrition diagnoses in hospitalized patients: United States, 2010. Journal of Parenteral and Enteral Nutrition. 2014;38(2):186-95. 4 Tappenden KA, Quatrara B, Parkhurst ML, Malone AM, Fanjiang G, Ziegler TR. Critical role of nutrition in improving quality of care: an interdisciplinary call to action to address adult hospital malnutrition. Journal of the Academy of Nutrition and Dietetics. 2013;113(9):1219-37. 5 White et al., 2012. Op. cit. 6 Lean M, Wiseman M. Malnutrition in hospitals. BMJ. 2008;336(7639):290. 7 White et al., 2012. Op. cit. 9 Only 28.3 percent of stays with underweight diagnoses were reported as present on admission. However, the International Classification of Diseases, Ninth Revision, Clinical Modification (ICD-9-CM) V codes for body mass index that are part of the underweight malnutrition type (V85.0 and V85.51) are exempt from present-on-admission reporting. 10 The Nielsen Company. Nielsen Demographic Data. Available: https://www.claritas.com/. Accessed November 8, 2017. 12 Agency for Healthcare Research and Quality. HCUP Cost-to-Charge Ratio (CCR) Files. Healthcare Cost and Utilization Project (HCUP). 2001-2013. Rockville, MD: Agency for Healthcare Research and Quality. Updated November 2015. http://www.hcup-us.ahrq.gov/db/state/costtocharge.jsp. Accessed February 17, 2016. 13 For additional information about the NHEA, see Centers for Medicare & Medicaid Services (CMS). National Health Expenditure Data. CMS Web site May 2014. http://www.cms.gov/Research-Statistics-Data-and-Systems/Statistics-Trends-and-Reports/NationalHealthExpendData/index.html?redirect=/NationalHealthExpendData/. Accessed February 17, 2016. 14 American Hospital Association. TrendWatch Chartbook, 2014. Table 4.2. Distribution of Inpatient vs. Outpatient Revenues, 1992-2012. http://www.aha.org/research/reports/tw/chartbook/2014/table4-2.pdf. Accessed February 17, 2016. 15 Centers for Medicare & Medicaid Services. Hospital-Acquired Conditions (Present on Admission Indicator). Reporting. Last modified February 12, 2014. http://www.cms.gov/Medicare/Medicare-Fee-for-Service-Payment/HospitalAcqCond/Reporting.html. Accessed June 29, 2016. Internet Citation: Statistical Brief #210. Healthcare Cost and Utilization Project (HCUP). September 2016. Agency for Healthcare Research and Quality, Rockville, MD. www.hcup-us.ahrq.gov/reports/statbriefs/sb210-Malnutrition-Hospital-Stays-2013.jsp.